Not a great picture I know (it's blurry and he's not even facing the camera) but this is the only image that exists (in our archives anyway) of the mysterious man we called Bob The Chemist (or Bob The Toy Tester). 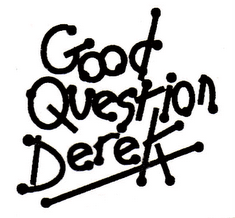 During the early 90's Good Question Derek played a large number of gigs in and around the Reading metropolis. Starting with the debauchery that was Fat Jacks (at the Old Bell in Grazely Green) the band were soon spotted by a local promoter called Haydn Wood (aka PC God - but that's another story for later in this Blog). Haydn's Sound Foundation organisation promoted the band in the Berkshire area for a number of years and we played literally 100's of gigs in pubs and clubs from Reading to Wokingham and everywhere in between (Winnersh). One thing (or person) was always present at these gigs. There standing at the front, licking his lips in an amphetamine induced frenzy was Bob The Chemist. Several gigs after we first noticed the speed freak Jules approached him and ascertained that his name was Rob and he worked in a chemist (how else did he get this much speed) and hence Bob The Chemist was born. It was only a couple of years later that we found out that the whole chemist thing was some confusion within Jules' mind (as many things are) and in fact Rob worked in a laboratory testing toys to destruction. 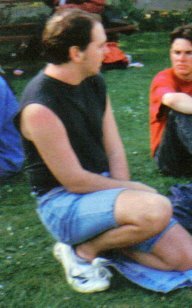 Bob became a good friend of the band and help us out many times at these Reading gigs however none of us know where he is now! If you know Bob, or are Bob - contact us and let's set the story straight! A rare spotting of 'the Chouch' too I see.